There are the basic serving rules that every table tennis players should know! The official rules and regulations of ITTF help you to avoid doing the illegal serve in table tennis. I also explain some study cases of “fault serve”. The hand signals (gesture) of the umpire are also discussed. Read more about the official laws of table tennis here. Bad or good call of “Fault Service”? You should throw the ball up, and the distance should be at least 16 cm from your fee arm. To do the legal service, you must throw the ball near vertically! If you throw toward your body, the umpire can call the “fault serve”. Your free arm which holds the ball must be open. The ball must rest on the palm, but not on your fingers. You hold the ball, and contact the ball behind the end-line. If you serve from the side of the table, it’s an illegal serve. I’ve seen that Jun Mizutani was called “fault serve” when he served at the side of the table. If you serve when the ball is inside the playing surface (the table’s surface), it’s illegal! Hidden serve is very common in table tennis. It is considered as “tricky serve” in table tennis. The server can hide the ball with the head, the arm, and the shoulder. Don’t hide your serve! It counters the official table tennis rules. 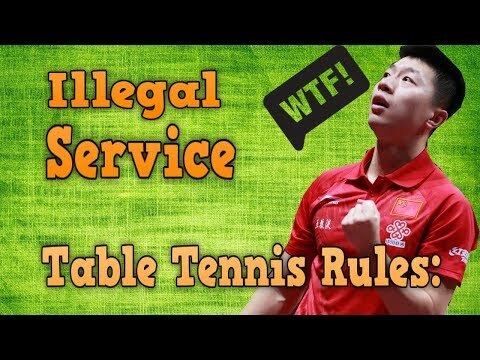 I’ve shown you some examples of the most used “illegal service” in table tennis. Here are some additional rules that you should know! Sometimes the umpire won’t explain you “word by word” how to serve. They just call a “fault serve” with their gestures. So here are the hand signals of umpire about the serving rule that you understand! To do the legal service, you need to throw the ball near vertically upwards, and at least 16cm after leaving your free arm. This is how the umpire will explain your fault. Her finger represents the ball, she can also say “Not High Enough”. You should hold the ball with an open palm. This rule is to avoid impact spin on the ball with your hand. The ball shall not be hidden by the server body or by anything they wear or carry. Hidden serve by the head, and shoulder is the most used trick, by top players. ITTF umpires should focus more on this aspect to keep the game fair. The umpire will fold her arm to her body and can say “Hidden serve” by your body. You can not throw the ball from below the table. It against the official ITTF table tennis rules. The umpire will use the finger (represent the ball), her palm open downward represents the table. And this hand signal means “ball below the table”. In table tennis, you should serve with the ball above the table surface and behind the server’s end line. The umpire gives the point for your opponent. She uses her finger to show the ball, her palm opens downward to show the table. She could say “inside the end line”. This fault is very common at the amateur level. Many new players throw the ball with their fingers! It’s not correct. The ball must stay on your palm, not your finger! The umpire called a “fault serve”, and showed you that you throw the ball with your fingers. Her palm is open and upward which represents your free arm. Her finger shows the ball (which touches the fingers of your free arm). This is very subjective! ITTF didn’t cite how many angles (60 degrees, 80 degrees, etc) which is an accepted angle. So you should throw the ball “near” vertically! Some umpire will say, it’s OK! But another one could say “Fault Serve”. So it depends! Some of the ITTF umpires are “bad umpires”. Bad call affects not only the players but also the viewers. Let’s study and discuss this case, for example! No offense! But some umpires don’t even know to serve correctly. Give them the racket and ask them to serve, you will laugh. Because they don’t play table tennis, they apply the rule in the “harsh” way. The most “annoying” and “illegal” serve is “hidden serve”. If you play table tennis, you will understand this. In this case, the umpire made the “fault serve” of Ma Long, because he didn’t throw high enough, at least 16 cm. Let’s see. I’m sometimes “angry” with the quality of some ITTF umpire, even the International level umpire. Some umpires even don’t play table tennis, they just take some formations about the rules, and try to “teach” the pro players how to serve! I will make a video about 3 types of umpires in table tennis “The Good, The Bad, and The Ugly”. wow. so informative. thank you coach for the umpire signal. I now understand.